After that first ultrasound I was excited that our baby had a heartbeat, however given that we had previously had many miscarriages between 6-15 weeks I wasn’t completely convinced that I would make it past the 12week ultrasound. In the meantime I found a new OB, he delivered at 2 private hospitals and he would deliver at RNSH. He had been recommended to me by a few friends as well as my GP. I had my first consultation with him and he was lovely, he was very thorough and spent way more than the allocated 15mins with us, not only did he order extra tests for us but he also ran through with us all the emotions that he expected us to go through over the coming months and told us that everything that we would feel, especially anxiety was absolutely normal and he expected me to be a bit of a ‘basket case’ and told me that I was able to call him or come in to see him whenever I needed to, he said to me ‘Even if you have a sore toe and you are worried that your sore toe could affect the baby you can come in to see me and I will help alleviate your concerns as well as address the problem that you present with.’ Both Ryan and I loved him, he was very professional, he was very thorough, he was compassionate and understanding but most of all he seemed to be quite humble, yes he was one of the best OBs around, but he didn’t have any arrogance about him, he insisted that we call him by his first name rather than Dr and he put both of us at ease. So after our first meeting with this OB we had lots of blood tests to do, a referral form ready for our 12 week ultrasound and he wanted me to use clexane injections (not just till 20 weeks but for the whole pregnancy) as well as low dose aspirin, a calcium tablet and high dose folic acid every day. It’s a hard concept not to want to wish your life away (especially as that would mean wishing part of Alethea’s life away) but I just wanted the 12 week ultrasound to come and go as quickly as it could. Each day I wondered if this baby was still alive, I kept trying to feel the pregnancy symptoms but they just weren’t there. Finally the day of the 12 week ultrasound came and unfortunately Ryan had been called away to another state on business so I told my parents that we were pregnant and asked them if they would come to the first scan with me. They were both shocked to find out we were pregnant and they said. ‘We are not going to tell a soul that you are pregnant, not your grandma, not your aunties or uncles, we won’t tell anyone until you are ready to let people know’ So the morning of our 12 week ultrasound I dropped Alethea off to daycare (it was really important to me that she didn’t know that we were pregnant, I didn’t want her to get her hopes up and be all excited only to have something go wrong, she was too young to have to deal with all the emotions that go with the loss of yet another baby) and I met my parents at the ultrasound place. Dad told me that he would wait in the waiting room for me while mum came in to be with me, and I told my dad that he was more than welcome to come into the scan if he wanted to, which he did. As soon as the technician put the gel and the probe on my tummy I saw the flicker of a heartbeat and my heart skipped a beat with excitement, I hadn’t expected to make it that far and I was amazed that I was still pregnant. Dad sat there in awe of the whole process, he couldn’t believe that he was seeing a tiny baby on a screen, he could see every detail of the baby and he just sat there shaking his head in disbelief, he thought it was amazing. I called Ryan as soon as the scan was finished and told him the good news and he was very excited and happy and apologised that he was not there to hold my hand and see our scan. A few days after scan, Alethea stumbled on some of the pictures of the ultrasound (I really don’t know how she found them) anyway she came to me in the kitchen and handed them to me and said in a very direct and demanding voice “mummy what are these?” and I told her that they must be some of the pictures from when Liam was in my tummy, and she responded to me saying “mummy, I was with you for all the pictures of Liam, and Liam didn’t look like this, do you have a baby in your tummy?” and I said that it would be nice to have a baby in my tummy, but I thought the pictures were of Liam (I never told her that there wasn’t a baby, because I didn’t want to say that, but I never said that there was one) and she responded to me by saying “Don’t you lie to me mummy, I think that this baby is in your tummy” and instead of saying yes or no I told her that the picture looked a little bit like a jelly bean lolly did she think so as well, and that had her in fits of laughter and I was able to divert her attention and she forgot her line of questioning. I had planned to go back to work early January and it was at this point that I realised that if everything continued merrily along, by the time I returned to work I would be 17 weeks pregnant (which would mean I would work for only 16 weeks before going on maternity leave again) and I didn’t think that my work would be too happy about that, but there was nothing that I could do about it. Returning to work was very hard for me, I returned 6months prior to when I had originally planned (if Liam had of been alive I would have taken a whole year off) and returning to work meant that I needed to care for others. Being a clinical pharmacist, I was going to need to look after the pharmaceutical needs of lots of patients, I was going to have to listen to the elderly patients tell me about their bowel habits and actually care about what they were saying, and that first day that I was there all I could think of was “who cared for my little boy, who put my little boy above everything else” and the answer was nobody, everybody who looked after Liam while he was alive and while he was in my tummy had failed him. This played on my mind and I really didn’t want to care for any patients anymore, however a very wise friend of mine told me that I should care for my patients the way that I wished that Liam was cared for and do my absolute best for my patients as that was what Liam deserved and didn’t receive, and it was also what these patients deserved, and that changed my frame of mind altogether, and I wanted to once again be a good pharmacist, I wanted to do the best that I could, and I wanted to have empathy for my patients as that is what they deserved, and that is what I tried my hardest to do. Ryan and I chose not to tell Alethea that we were pregnant until after the 20 week ultrasound, to make sure that everything was ok with the pregnancy. We ended up holding off until 22 weeks (when my tummy was very obvious) and then we told her that mummy had a baby in her tummy, Alethea’s first question was “Will we be able to bring this baby home?” and I wanted with everything that I am to tell her that yes we would definitely bring this baby home, but I couldn’t do it, so I told her that mummy and daddy both hoped that we could bring our baby home, that we wanted this baby to come home more than anything in the world, I never told her that this baby wouldn’t come home, but I never told her that it was a guarantee that this baby would live with us because I couldn’t guarantee that. Around 22 weeks I chose to disappear from society, what I mean is that anybody who I didn’t see on a regular basis I chose not to see from this point on, and I actually avoided most people. People that I had to see, such as work colleagues and friends that I saw all the time knew that I was pregnant, but anybody that I didn’t see regularly I kept in the dark, I just couldn’t handle the extra pressure/stress from people worrying whether this baby was going to live or die and I didn’t want people thinking that I was ‘over’ Liam just because I was having another baby. Anyway my pregnancy was uneventful, I had many, many extra tests, ultrasounds and CTG monitoring and everything came back perfect. My OB had told me that my head wouldn’t let me get past about 36 weeks and he said to me ‘when you can’t cope after 36 weeks, you let me know and all going well we will deliver your baby’ however he told me that if I could handle it he would like to deliver at 37.5weeks. I can’t tell you how nervous I was for those last few weeks, I knew that my baby was alive inside me and I wanted the baby out, but I also knew that the longer I waited the better it was for the baby, so I made it to 37.5weeks and on the 12th June went in for an elective C section. I was taken into the operating theatre first without Ryan so that the anaesthetist could put in a spinal, and then Ryan entered the room, it all happened so quickly that it was amazing, and all of a sudden the obstetrician was holding up a screaming baby, it was at that point that I realised that I never really expected this baby to live, although I had told myself that we were having a baby, I really and truly expected this baby to die, and when I saw this beautiful pink screaming baby I burst into tears, I couldn’t believe that he was alive, he was gorgeous and I fell totally in love with him even before he was placed in my arms. He was a little dot, weighing only 2.94kg (6lb 5oz) but perfect in every way, and so our family became a family of 5, as we welcomed William Ted Campbell into our lives. As soon as we could we called my parents (who were looking after Alethea) and Ryan said to her “Mummy has had a baby boy” and she asked Ryan if this baby was going to die as well, and Ryan said to her “No this baby is alive and we are going to bring him home” and apparently my parents tell me that Alethea held onto the wall next to her and jumped up and down excitedly for 10minutes, until my parents could get her into the car to come and see us in the hospital! Alethea’s excitement to see our baby was priceless, she was beaming from ear to ear, she was finally a big sister to a baby that she could cuddle and help me look after. She was and is so gentle with Will, she looks after him more than I thought would be possible, she loves him more than I thought a sibling could love a newborn baby and she is caring and protective of him. That first day I was rather unwell, I was hypothermic and my blood pressure was drastically low (60/40 for the medical people) and so I had 5 rapid responses (that’s where the nurse presses a button on the wall and everyone comes running into the room to help out) but each time they came, instead of finding a sick/poorly person they encountered me, an absolutely beaming mum who couldn’t take the smile off her face, they took me to the high dependency unit that night as I was unwell, but I really didn’t notice that I wasn’t well, I was just so happy. I slept that first night with my little boy beside me (he started off in his cot, but because I had the C section I found it hard to get him up and down and after 2 times getting him out of the cot I gave up and placed him next to me) I didn’t sleep that night, I just cuddled this little baby the whole night, feeling his warmth, feeling the rise and fall of his chest, feeling him snuggle his little head under my chin and feeling his milky breath against my skin, and I loved every second of it. The next day I was allowed back down to the maternity ward where I needed to attend a couple of the group sessions (physiotherapy etc) and I looked at all the mums who were exhausted, having been up most of the night with their little ones and they looked physically drained, I on the other hand was the total opposite, I was full of energy and excitement and beamed the whole time, having experienced the loss of Liam I was in an extreme state of happiness, while these other mums were tired from no sleep I was there just ecstatic to have a baby. We were lucky enough to have a large room with a double bed as well as my bed in it, so Ryan stayed the whole time in hospital with me, and so after 3 nights we headed home, the way it should have been with Liam, as a family, we had our baby in the car with us, and we couldn’t wait to get home and start our lives as a family of 5, before we got home however there was one thing that we had to do, and that was introduce Liam to his little brother William, and so on the way home from hospital we once again stopped into the cemetery and told Liam all about his little brother. A friend 0f mine posted on FB about a birth photographer called Jen, from Nurtured by Jen photography who was looking to find someone who had extenuating circumstances to do a birth photography session for free, I wrote to this lovely lady and told her about our circumstances when I was 13 weeks pregnant with Will, and she wrote back to me telling me that she would love to help me out, however I hadn’t realised that she was in a different state, however Jen was lovely enough to get in contact with Anna from Anna Todd’s photography and she told her about our circumstances and Anna got in contact with me and told me that she would love to document our birth story. Below is our story that Anna has put together for us, and it is beautiful, it captures every moment from our very special day. I have waited for this post holding my breath. Hoping and wishing for everything to be ok.
Congratulations to the beautiful family of five!!! Oh Amanda, this is so beautiful. I’ve followed your family’s journey and have tears of joy for you, Ryan and Alethea as I watch William’s Birth Day. Your faces and love in your eyes says it all. Anna has certainly captured this day in a very special way for all of you. Wishing you lots of love and happiness. Congratulations on the safe arrival of your beautiful boy. Congratulations Amanda lovely to see pictures of William Ted, a beautiful name for a beautiful boy and a link to his big brother. So so very happy for you all. What an utterly beautiful video capturing all the treasured moments from William’s birth. How blessed is he to have a big brother and sister and two amazing parents. Enjoy the love, laughter and joy he brings into your lives. I couldn’t read and not comment. Just beautiful, no words can express the joys I see in your little girls face. I have tears for you all. Congratulations and once again, thank you for sharing your story. Beyond words! Such magic moments to relish. All the love and happiness you were beaming in your images is absolutely deserved and may more grow and expand in your family. Amanda and Ryan, I am sooooooo happy, relieved, overjoyed, proud of all you have managed to do in the past year. Including growing this exceptional little fella. He is adorable! And the most loved little thing – by all of your family, and those of us watching by the sidelines. Welcome to the world William! Boy did you pick a great family to join. I cannot wait to meet him and tell him all about the day I got to spend some precious moments with his big brother, Liam, who will watch over him and Alethea through their lives. What a precious gift they have. Especially love those pictures of the world’s proudest big sister. You can feel the joy jumping out of those photos. Yours and Ryans too! Not so much from WIlliam in the photos as he first comes into the world – the cutest face, grumpy, as though he’s saying “Do you mind, I was so comfy in there!” What a lovely thing William will get to see in years to come though. He is so beautiful. Amazing. So much I could say, I don’t know how. Congratulations to the 5 of you ❤ Liam would be proud and I love that his name is in William. Need I say enjoy him!? This was a wonderful read congratulations to you, your husband and daughter and not forgetting Liam. As on many times before as I have read your story and I know what you go are through I cry not only for you and your family but for me, all the feeling you felt after losing Liam I felt with my daughter but this story today was different it was “happy” I cried because you have a family of 5 and reading what you wrote was happy you looked so happy and proud and I think it is wonderful to see this change. You will never forget Liam he is in your heart forever but you have brought a new life into this world and it is just amazing you all look so very happy in the video and again its wonderful to see. I have followed your story and was anxious to read this post. I am so very happy for all of you. You have another beautiful son. What a wonderful family, of 5. I wish you all of the happiness in the world. Sitting here bawling my eyes out!! So excited for your beautiful family hon. Welcome little William. You have a very special Guardian angel in your big brother Liam watching over you. I’ve been following your story since you started writing, but this is the first time I’ve commented. Liam passed away shortly after my friends son Loken was also born sleeping. I’ve shed many many tears while reading your blog, and I just wanted to say that this entry brought about tears of joy for you and your family of 5!! I hope you continue to blog about your journey, as I (and it seems many others) feel like I almost actually know you through reading your entries. 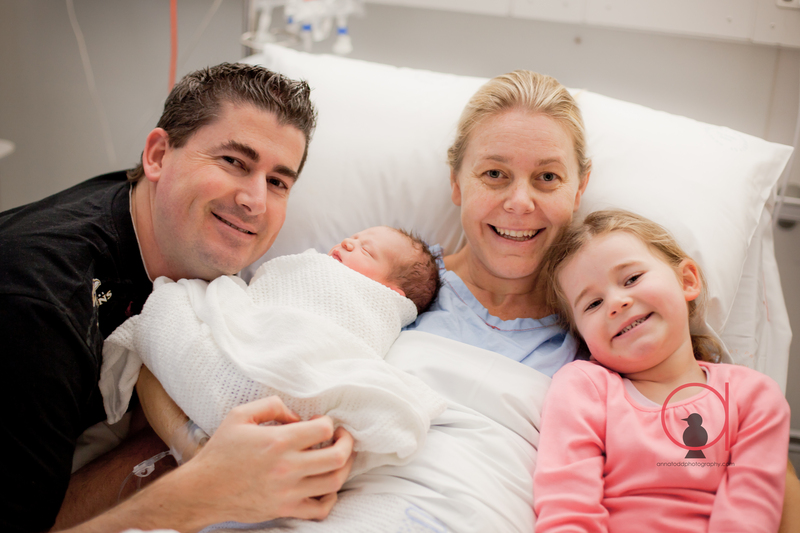 Welcome to the world little William – what a lucky little boy to have such loving parents and a big sister who adores him, as well as his very own guardian angel brother in heaven. Just beautiful… Thank you for sharing your story. I wish your family all the happiness in the world. I won’t ever forget your Liam. It has been an honour to follow your family’s journey and it has had a significant impact on me. Its surreal to be writing to you as a stranger as i feel like i know you so well. I have followed your journey right from the beginning and words cannot express how happy I am for your beautiful family of five. I also love that you have incorporated Liam in to Williams name, absolutely beautiful. Congratulations and may Liam always shine brightly. Congratulations!! What a beautiful family. Thank you for sharing your journey. Enjoy making many happy memories for your children to treasure. I absolutely love how you incorporated Liam’s name into Williams, beautiful!